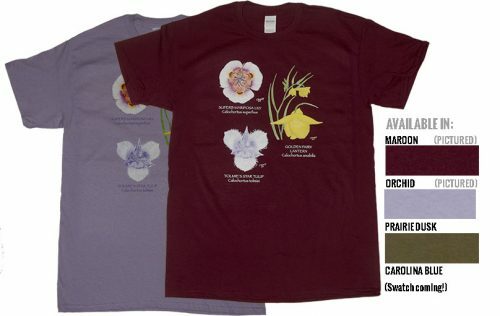 This short-sleeved design includes three iconic California lilies, Humboldt Lily (Lilium humboldtii), Leopard Lily (L. pardalinum), and Lemon Lily (L. parryii). 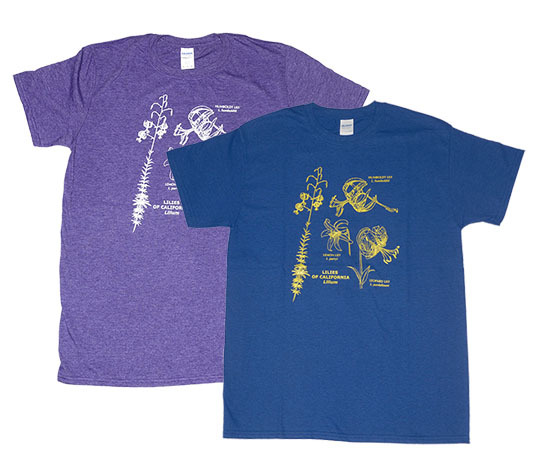 The illustrations are line drawings screen prints in white, yellow, or green text, depending on the shirt color. Available in Purple Heather (white lettering), Antique Royal (yellow lettering), Cherry Red (yellow lettering), and Natural (green lettering). Need 2XL?, I do have some, contact me. All shirts Gildan 100% pre-shrunk cotton. The Antique Royal shirt is 10% polyester. The original art work will appear in a forth-coming illustrated guide to lilies and their relatives.